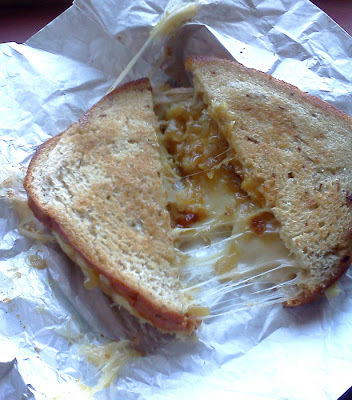 Like Grrche, this truck dishes up both plain and fancy cheese sammies, but Wheyich's menu is the more-amusing read. Their wares are named after famous bombshells (Marilyn, Sofia, Angelina) and menu descriptions use plenty of adjectives like "succulent" and "sumptuous," the latter referring to turkey. The next time I tried a Wheyich lunch, I was happy to play guinea pig with a new menu item, a cold shrimp salad sandwich named Eva (I'm guessing named for Eva Longoria, because she is physically a shrimp). 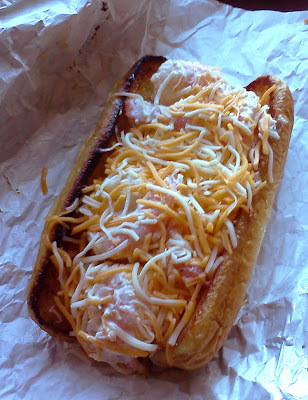 Closer to a lobster roll than a grilled cheese, the "decadent" shrimp salad was served on a toasted hot dog bun and topped with shredded jack and cheddar cheese. While "decadent" might conjure up thoughts of truffle oil or caviar, the salad was simply large-ish shrimp bound in a lightly onion-y mayonnaise seasoned with a bit of Old Bay; the cheese was an unnecessary element. Overall, Eva will fit the bill nicely if you're in the market for a shrimp salad sandwich. I also tried the lone dessert option, a salted caramel brownie. When I unwrapped it, I found the caramel completely stuck to the wrapper, the brownie naked. It was ok, but a bit too sweet and not salty enough. Wheyich's prices are fairly reasonable: Eva, and her crabby seafood friend, Naomi, are the most expensive items on the menu at $7.99; meat and vegetarian versions come in at $6.99; and the lowly cheddar-on-white Marilyn is a mere $3.99. While their schedule is posted on their Web site, they occasionally change locations at whim, so check their Facebook page and Twitter feed for daily updates.